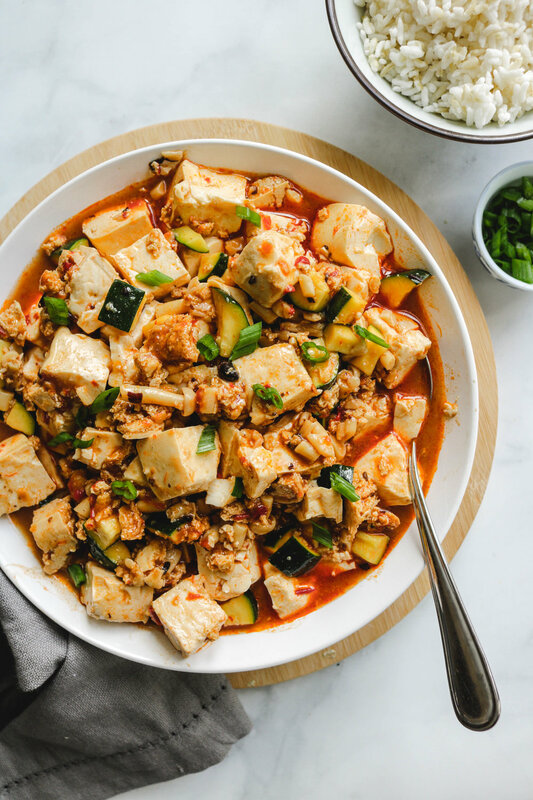 This Vegan Mapo Tofu brings together the flavours from both Japanese and Chinese versions of Mapo Tofu. 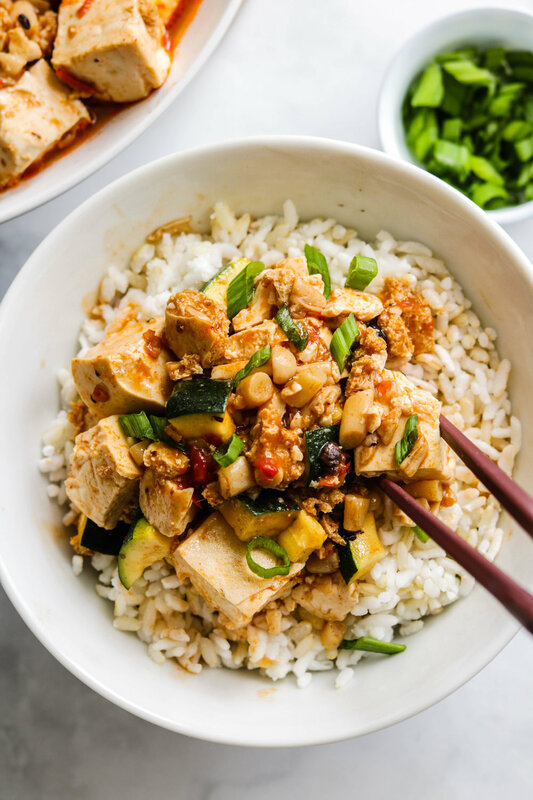 The tender tofu is covered in a incredible aromatic spicy sauce with bits of mushroom, zucchini and crumbled tofu for texture. Mapo tofu was one of my favourite dishes growing up. Since my mother is Japanese, majority of the time I had the Japanese version of Mapo Tofu (also known as Mabo Dofu), over a bed of hot steamy rice. I recreated her recipe using zucchini, mushrooms and tofu crumbles to replace the ground pork traditionally used. Mapo Tofu is a popular dish in Chinese cuisine, particularly from the Sichuan province. The classic recipes you may have tried or seen at restaurants is usually made from soft tofu, ground meat, a thick spicy soy bean sauce with Sichuan peppercorns for that extra kick. The Japanese version is quite similar, but much less spicy. Chinese cuisine in Japan is considered a luxury, but in recent years during my visits to Japan, I found a lot of restaurants and pre-made meals inspired by Chinese cuisine; including this incredible Mapo Tofu dish. Everyone will have their own variations of mapo tofu, from ingredient ratios to cooking methods. The main difference between Chinese and Japanese Mapo Tofu is that Chinese Mapo tofu uses Sichuan peppercorns while the Japanese version uses mirin, sesame oil and miso paste which makes the overall dish less spicy. My take on the classic Mapo Tofu dish is of course, vegan but does not lack in its authentic aromatic flavours. The texture of the ground meat usually used in this dish also won’t be missed thanks to the mushrooms and tofu crumbles. If you’re not a fan of tofu crumbles, you can also use groundless beef grounds or TVP. Let’s check out what flavours are going into this amazing Vegan Mapo Tofu! Use a large non stick wok for this dish as it will make it easier for you to toss the tofu. This is the one I use and love. When tossing the tofu, it’s important to be gentle so that they do not break apart. You want to be try and keep the tofu cubes kept in its shape. I recommend eating this Mapo Tofu freshly made as the sauce will lose its thickness over time (the photos shown were taken quite a bit after cooking due to camera issues, you can see that the sauce has lost some thickness). However, it does taste just as good the next day! If you recreate this Vegan Mapo Tofu dish please share it and let me know what you think by tagging me on Instagram @lisakitahara, I love seeing all of your tasty recreations! In a small bowl, mix the doubanjian, mirin, miso paste, sesame oil and fermented black bean paste, corn starch and water until combined. In a large skillet wver medium high heat, sautee the garlic and ginger with a little bit of sesame oil (or water for oil-free) until fragrant. Add in the shimeji mushrooms and pressed crumbled tofu until slightly browned. Add the sauce and once it begins to lightly boil, add in the tofu and toss gently until the tofu is covered in the thickened sauce. Plate on a serving dish and top with scallions and sesame seeds. Air Fryer BBQ Cauliflower "Wings"